There’s an attitude that if you can dream it, you can build it. People come to the Mountain West to be surrounded by natural beauty. It’s their purpose to connect with nature. It’s the place that matters. Achieving this connection when building a home requires glass, and lots of it, as well as doors that open and seem to disappear. This style of buliding exists, and people enjoy these features in homes in Hawaii, Southern California, Florida, and Arizona. Can it be done in the mountains? Achieving the same look for mountain homes as homes that function well in gentler Mediterranean, tropical, and desert climates presents an obvious challenge. The weather and its many variations seem counterintuitive for building the same kinds of structures. Comfort is of course paramount, but homes must also be built to conform to codes with standards for energy performance. But, as with the history of construction, where there is a will, there is a way. Wide openings between rooms and patio spaces are important for mountain living to create the outdoor connections people desire. Steel is known to conduct the chill, so how can it be made to function as a barrier to heat transfer? The answer lies in the term “thermally broken,” and according to Brad Brewster, a separator material makes the thermal break. In the case of Arcadia Custom, they use GRP, glass reinforced pultrusion. It is installed between the layers of the steel frame. The steel frame with a thermal break holds double panes of insulated glass with an air space between for improved energy performance. Brewster comments that glass technology has come along way over the last 10 years and is available with new low-E coatings and composite spacers that also greatly improve the overall energy performance. Bottom line, the steel construction and glass combine to transfer far less heat than in the past to perform better in cold climates. Modern mountain architecture diminishes barriers between the inside and outside a number of ways. Here, the same stone from the exterior comes inside. The glass doors and large expanses of windows bring in the views to the sky, mountains, and horizon to constantly declare a sense of place. “Wide openings between rooms and patio spaces are important for mountain living to create the outdoor connections people desire, and these lift-slide and multi-fold systems accomplish it with ease. Plus when the temperatures drop, they offer thermal protection. It’s a good combination,” reports Barrow. When View Point researches companies and weighs whether to sell the company’s products to its customers, one of the important factors View Point evaluates is warranties. “In the case of Arcadia Custom, they ship the glass installed from the factory. This allows warranty coverage on both glass and the metal components of doors and windows: 10 years on glass, and 20 years on doors and windows. This warranty is from an American company with an 85-year track record,” Brewster explains. 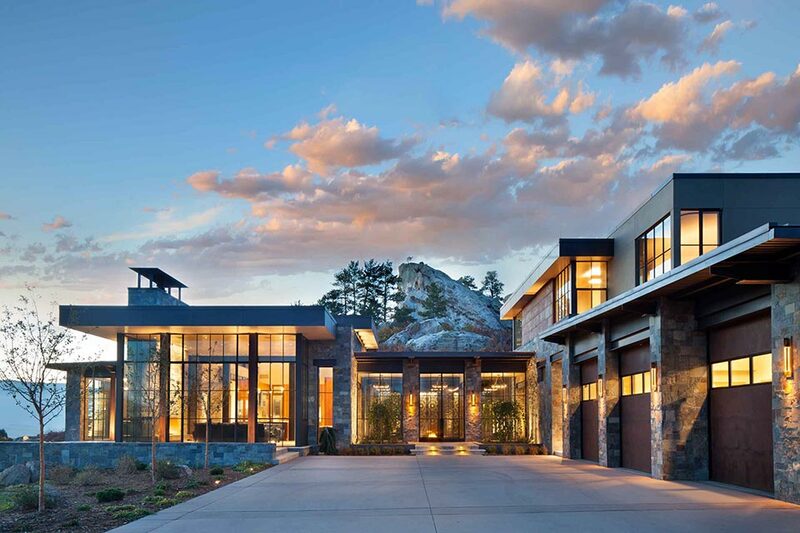 View Point is the customer’s connection to windows, doors, hardware, shower enclosures, and custom glasswork. “We bring our local, diverse experience, as well as our relationships throughout the world, to connect people to the right products. Because we connect building professionals to products that we know and trust and stand behind, they feel confident,” Brewster adds. He invites customers to visit the Jackson showroom for a consultation. For more information Please visit viewpointwindows.com.